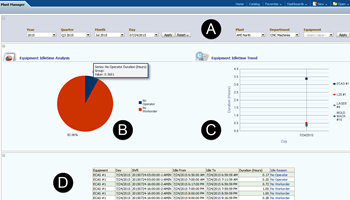 By using this dashboard the reasons for idle times of machines within a selected period (A) can be analyzed. Right to the pie chart (B) with percentage distribution of non-machine specific downtimes such as ‘no work order’ or ‘no operator’ a graph (C) with information about the trend of these states is shown. The table (D) at the bottom shows a list with start and end time as well as the reason for this type of downtime. Idle times are not (cannot be) acquired directly from the machine as the device is unaware of such organizational events, the device just reports state ‘Down’. The data is taken from user input into the Operational Data Acquisition (ODA) program.